Digital print on satin paper. 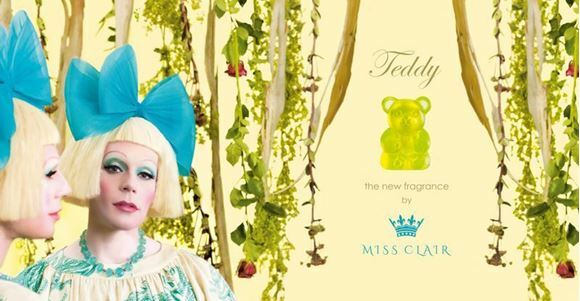 This is a parody perfume advert that satirises an influential artist to highlight and sustain Brand Art Sensation Debate on the relation between celebrity artists and luxury fashion brands. 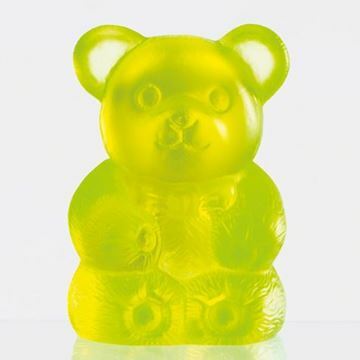 Teddy is a limited edition art sculpture made with fluorescent yellowcasted glass. No influential artist has endorsed, approved or vetted this fictional advert, the perfume bottle or any part of Brand Art Sensation which is published by Zaniol ltd. a limited company devoted to art, education and design.